Every time the weather gets nice, I get so excited. We only have a few months where scarves, boots, and coats are necessary and I am patiently awaiting for that day. I own way too many scarves for a woman who lives in Texas, but I'm excited to wear one maybe starting around Thanksgiving? Who knows. I am so excited to tell you guys about this past month of campus ministry! First, I would like for you to read sweet Jocelyn's story. Thank you all so much for praying for our fall camp! We had over a hundred students show up this year which is crazy big for a community college. Success isn't about numbers, but it was cool to see this many people show up. 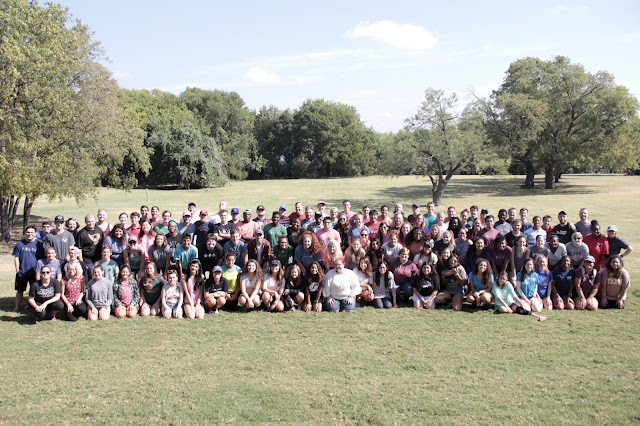 At fall camp, we played games, ate chik-fil-a, heard sermons from Garrett and Pedro, and participated in different forms of worship together. I know this experience was uncomfortable for a lot of people because it was uncomfortable for me at my first fall camp 5 years ago (yikes, im old), but it so worthwhile. The coolest thing about fall camp is perhaps the fact that friendships become solidified, and they become solidified at a place where they are interacting with the spirit of Jesus. During the worship night, a girl who is new to our community was visibly upset. I went to talk to her, but she just needed a hug. I said "What is God trying to tell you?" and she said "To share my story". She didn't tell me then, but I knew she would tell me at some unidentified later date. I actually ended up visiting her small group (our cores), and that was the night she was shared her story. The stuff she opened up about was stuff she had never told anyone, stuff that she was ashamed of, but she knew that God was calling her to be here and she felt safe to share those deep personal things. This is her first time back in a Christian community in a long time and it's a God deal that she feels at home. This year I get to mentor 6 student leaders as they mentor the girls in their small group. This is a new role for me and I learn something new every week, but it is honestly the part I look forward to the most! I meet with each of them, one on one, every week. Each time I think I'm going to sound really smart and cool, they end up teaching me more about God's character through our relationships. I am so thankful for them and their willingness to lead a group of girls on our campuses. Please be praying for us as we navigate this year together! Thank you so much for all of your support! Please don't hesitate to hit me up for lunch, or a phone call. Love you all! I pray that your season is merry and bright and filled with time spent with wonderful people whom you love. I know during this time of year, it can be easy for me to forget about the actual reason we celebrate this holiday. I think the older I get, the more profound the life of Jesus becomes to me, beginning to end. And the more profound his life becomes to me, the more affection the Lord gives me for campus ministry. There is a very real threat to college students, especially at UNT, and the healing Jesus offers in transformative. So, I ask in the spirit of the season, please pray for radical encounters with the Holy Spirit for the students in Denton, TX. Hey, everyone! I'm so excited to update you on what has been happening. But first I want to thank you for supporting me prayerfully, financially, and I want you to know that your gifts have been blessings to our students. One of those students is Ulises from UTA. I met him briefly at our leadership conference (SICM), but it was really cool to read his testimony and get to know him a little better. Thank you for pouring into campus ministry and blessing people like Ulises. As I'm writing this, it is cool yet sunny 60 degrees outside. (Thank God). I am very surprised at how quickly the weather has changed, not only that but at how it seems it will stay that way for a while. I hope you are able to enjoy the weather at least a little bit this week, if that's your thing of course. As always, I like to start this blog off with our monthly student testimony. A lot of times I know who the student is, but this month I don't. And I say that to emphasize how far the reach of this community is in our vast metroplex! And that's exciting and it's the vision that you are investing in. So, thank you. Please take a moment to read Veronica's testimony.